It's nearly the weekend! Hooray! I don't know how you've been this week, but I've really missed that hour that we lost last weekend when the clocks went forward. How I've managed to make it through till Friday without being a serious danger to myself or anybody else is a bit of a mystery, but I'm grateful! I've decided that the safest thing for me to do today is to stay indoors and knit. I probably should stay right away from the computer as well, but as long as I don't do anything overly technical I think I'll be OK. It's not technical at all to listen to a podcast, is it? I'm super-excited and very proud to tell you that I'm sponsoring this week's episode of KnitBritish. 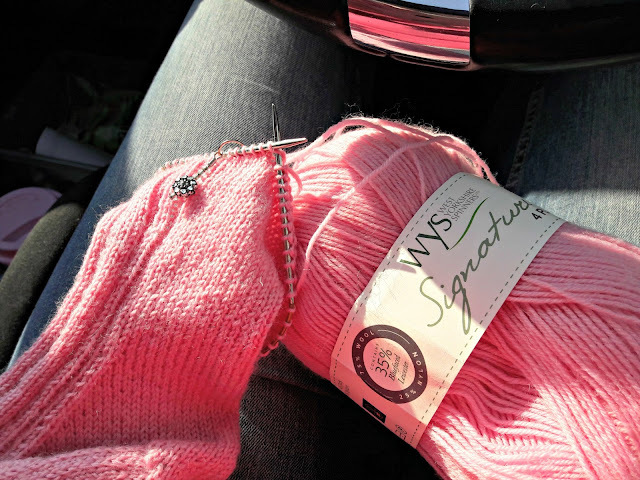 If you've never heard of KnitBritish, then let me tell you that it's the podcast and blog of Louise Scollay, who made the decision a few years ago that she would only knit with British yarns. It's been fascinating to learn about yarns that I've never even thought about and it's made me realise just how many people there are in the country who have small flocks of rare and not so rare sheep, or know someone who has and have been able to help them use their fleeces for more than just insulation or even worse, save them from being burnt because the price of fleece is so low. 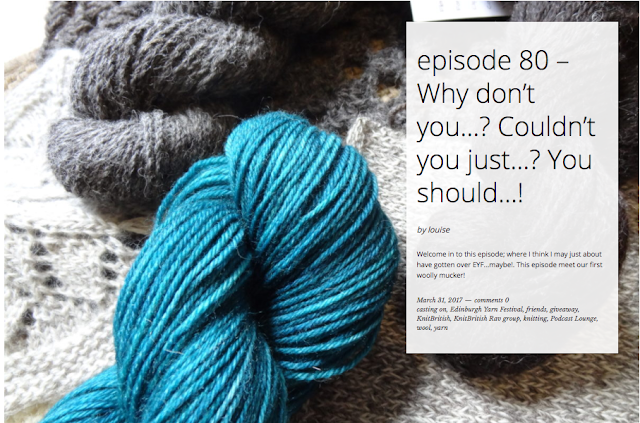 The podcast has also been really helpful to me in my search for no-nylon yarns as I've been able to follow links and leads to discover more about sheep breeds and which are most suitable for socks, so I was really delighted to get the opportunity to sponsor the episode as it feels as if I've been able to say "thank you". Louise had ten "Woolly Mucker" sponsorship packages available to listeners and I was lucky enough to be one of those ten. As part of the package, there was the opportunity to be a part of the episode and I have to tell you that I was really rather nervous when I sat down on Monday afternoon for a Skype conversation with Louise! I'm much happier with the written word - I've got time to think about what I want to say and I can edit as much as I like before I hit the "publish" button - so although I knew what Louise was going to ask me, it still felt like a giant step into the unknown. One of my concerns was that I can get a bit over-enthusiastic when I talk about socks and I also wave my hands around a lot when I talk (thank goodness this is an audio podcast and not video! ), but Louise has made a fantastic job of editing my sock-obsessed ramblings and although I find it quite disconcerting and not a little uncomfortable to listen to my recorded voice, I am thrilled to have been part of the show. And there are no surprises for spotting that I've moved on from Candy Floss (so last week, dahling!) and now I'm using Flamingo. Oh those stripes! 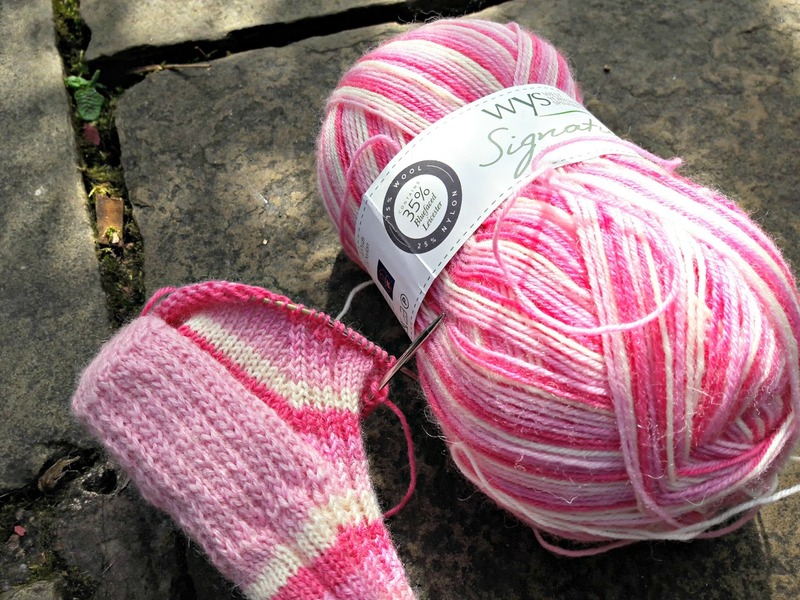 Is there anything better than a self-striping sock yarn? In shades of pink that make me want to eat ice cream every time I pick up the sock? Not much, I have to say. Everything else seems to have gone out of the window whilst I finish these socks and I know that I'm going to feel bereft once they're done ... until I cast on the next pair! I've not been doing much gardening in the garden much this week but my plan is to spend time there this weekend. There signs of life on the windowsill as not only my courgettes but my cucumber and climbing beans have started to grow - that really didn't take long at all considering that I only planted them last weekend. 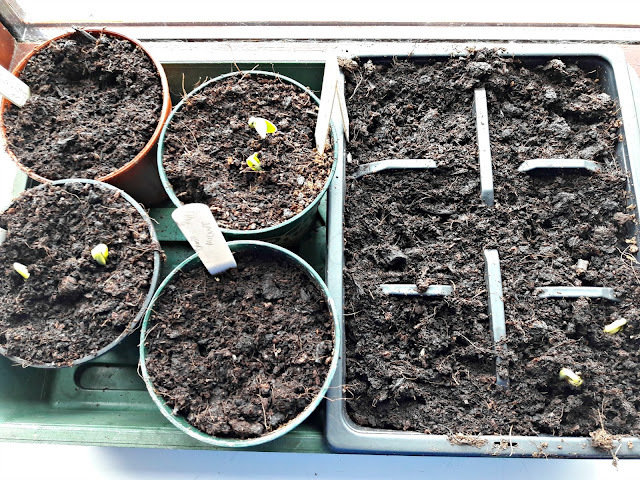 My peas have also sprouted in record time and I'll be planting these up this weekend along with the sweet peas that I've also got chitting and are also sprouting. 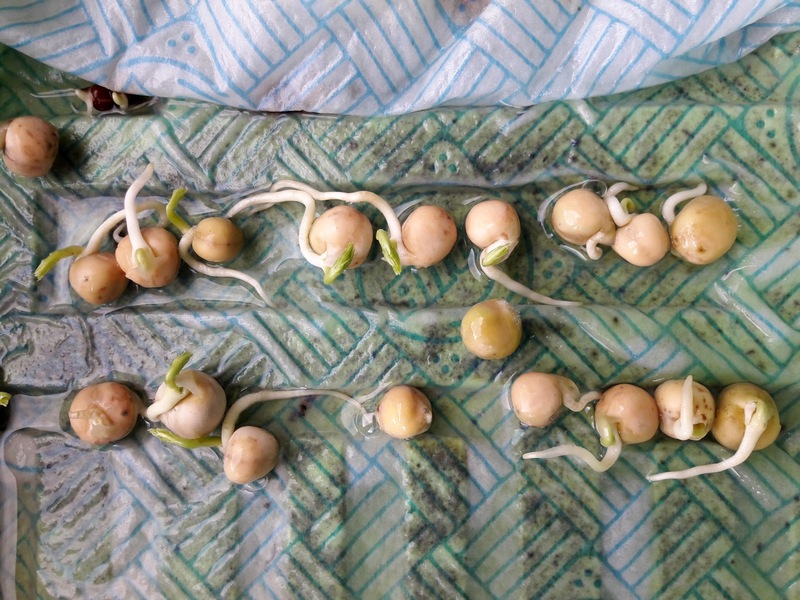 I love this time of year when seeds come to life! I don't have much more to tell you about what I've been up to this week - I've been concentrating on keeping myself in one piece, not losing the dog on our morning walks (spring smells make him super-giddy and I am the least of his concerns as hurtles off in pursuit of them) and knitting, of course. It's actually not been a bad week at all. We've had some glorious sunsets too. That always makes you feel good. Have a wonderful weekend, whatever you're doing, and stay safe! Funny how the yarn makes us think of things to eat. Flamingo reminds me of this pink wafer biscuits! I really enjoyed hearing your stories on the podcast. Recently I finished my first pair of socks using your basic pattern - thanks. I used DPNs because that is what I had, but can you please tell me what size circular needle (brand? )you are currently using because it looks smaller in the photos than what you recommended in your basic sock notes? Thanks. I dont know where its gone, but I thought I was signed on to Sock Along. I just wanted to say I agree about knitting relaxing you. I log on to my very old, and very slow computer each morning, and while I wait for it I knit. Before knitting (socks) I used to fume at the slowness of the computer. Now I just sit back and relax! WYS is my favourite sock yarn, I have the hollyberry colourway on my needles at the moment. Loving the pink flamingo. 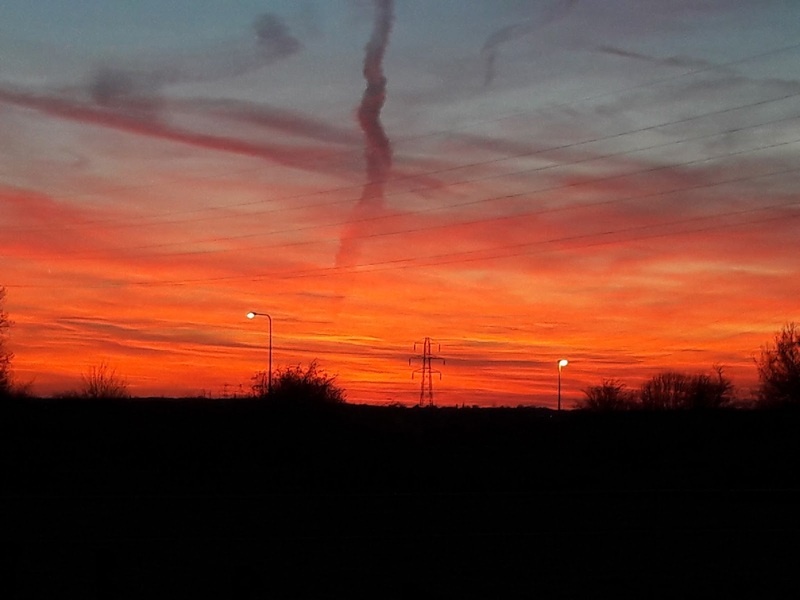 Fabulous sunset picture you captured. Seedlings sprouting mean lovely things to come and food to nibble in the future.